I haven’t always been a lover of dessert. For me, the carbs and cheese that came with my main dishes were the real stars. Dessert was just an afterthought that I could sometimes deal with. Mostly, I just went with a second serving cheese fries. These days, after experiencing some first rate desserts beyond ice cream and brownies, I have more love for the dessert. The first dessert Jim made for me when we first starting dating were crepes. I watched as he made the crepes in a small skillet, then whipped (by hand!) the fresh whipped cream that was then placed in the crepes with sliced fresh fruit. At first I wondered why in the world he would go through all this trouble when you can buy whipped cream at the store, both in a can and in a frozen bowl. Then I had a bite and I understood fully. There is no taste quite like freshly whipped cream, cool and airy with just a hint of sweet. 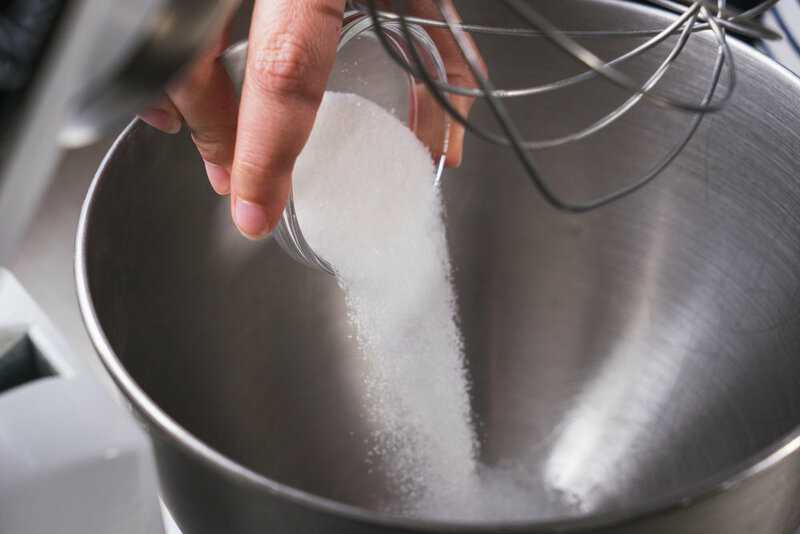 If you have a stand mixer, this recipe is almost effortless but if you are without, do not fear. It takes a bit more elbow grease, but the results are just as amazing. Remove from bowl and use on any dessert your heart desires. Or just dip a cookie in the cream and call it good! If you mix by hand, the best thing I have found is to have a mixing buddy to tag in and mix for a few minutes while your arm rests. You can also take short mixing breaks to give your arm a quick rest too if a buddy is not around. “Stiff peaks” will be when you dip a spoon or the whisk in, it sticks up off the utensil and does not run or droop at all. When your cream is at that level, you are good to go.